– Jim Rohn (1930-2009), U.S. author, entrepreneur and motivational speaker. About This Week’s Chat: Use It or Lose It! Our bodies are designed to move. We have more than 600 muscles, 206 bones, and about 230 moving joints as proof. Yet, many people sit for up to eight hours a day – and sitting isn’t good for your health. Do you know people who can’t bend down to reach something at the back of the cupboard? Or those who struggle to climb a few flights of stairs at work? And we’re not talking about folk with an illness or a disability here. Maybe you’re one of them. So, how do people lose their range of movement as they grow older? The answer is simple: gradually. It doesn’t happen overnight, but little by little. The less you use muscle groups, or bend and stretch, the less mobile you become. The body loves conserving energy, and it operates according to a simple principle: it will keep what you use. Maintaining what you don’t use takes unnecessary energy, so if you don’t use it, you lose it. Here’s the scary part: your brain and its countless neural pathways govern every movement you make, and if you don’t do certain movements, there’s no reason for the brain to maintain those neural pathways. This means that you not only lose the muscle’s ability to execute the movement, but those neural pathways shut down, too. Fortunately, these consequences aren’t permanent, and we can regain functionality and mobility and wake up old neural pathways. Have you ever thought of the role that health and fitness play in your productivity, motivation and energy at work? 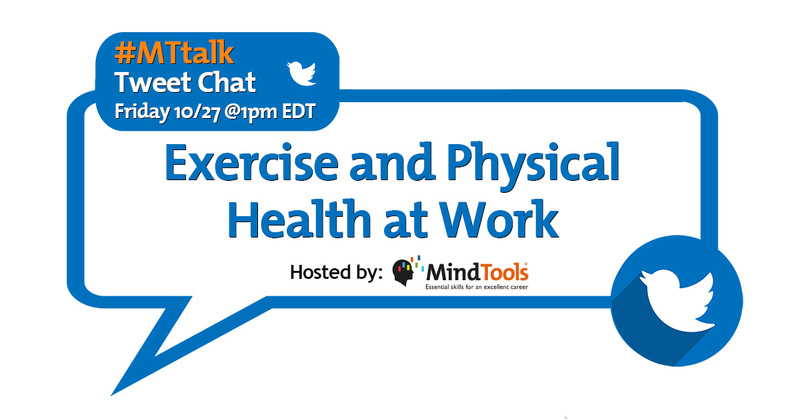 In this week’s #MTtalk Twitter chat we’ll discuss “Exercise and Physical Health at Work.” In our recent Twitter poll, we asked people how regularly they exercised. Almost half of the respondents said that they only exercise now and again or that they’re couch potatoes. To see all the results click here. How flexible could you be with team members who want to exercise during their lunch breaks? Are there any changes could you make to your diet to improve your physical health at work? What role does your journey to work have on your physical health? What changes could you make? How can you build more movement into your daily activities? What do you think is the most important benefit at work of being physically fit? What features of office design help or hinder physical health, and how can you influence them? In your opinion, do fit, healthy and energetic people stand a better chance of being promoted? Why? At Mind Tools, we like hearing from people all over the globe. We’d like to learn from you, too, and we invite you to participate in the #MTtalk chat this Friday at 1 p.m. EST (5 p.m. GMT; 10:30 p.m. IST). Remember, we feature great participant responses right here on our blog every week!